CoinDeal promises to provide quick and safe investing in an innovative exchange platform. Find out how it works today in our review. At the beginning, there were five cryptocurrencies available to trade on CoinDeal, like Bitcoin, Bitcoin Cash, Ethereum, Litecoin, Dash, and Quantum. In the first voting users of CoinDeal chose other cryptocurrencies which were implemented in two weeks since that date. These were Ripple, Nano, ByteCoin, Verge and Lisk. CoinDeal didn’t stop the development of the platform and from April 18, 2018 new cryptos such as Deep Onion, DraftCoin, FuturoCoin, Infinity Economics, and StrongHands are available to trade with dedicated wallets. That gives users 16 pairs ready to trade with BTC. 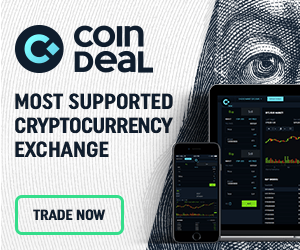 CoinDeal, found online at CoinDeal.com, is a cryptocurrency trading platform created by Verified Trading Solutions Ltd. The platform, like most cryptocurrency exchanges, aims to offer fast, safe, and easy cryptocurrency exchange services. You can trade cryptocurrency pairs and fiat currencies using the platform. CoinDeal was first announced in early March 2018. Today, the platform offers a small number of popular cryptocurrencies available for trading. The exchange all supports BTC/EUR trading. To support the exchange’s growth during the early days, the company is offering generous affiliate bonuses. During the first 3 months after launch, you can receive 50% of the trading fees paid by any members you refer to the platform. That number will eventually drop to 20% of the trading fees. CoinDeal offers cryptocurrency trading in BTC, BCH, ETH, LTC, DASH, and QTUM. As of now, the cryptocurrency only offers one fiat currency pair: BTC/EUR. Other notable features include transparent access to the platform’s funds, allowing you to check on your cryptocurrency deposits at any time. There’s also 24/7 support. Like most cryptocurrency exchanges, CoinDeal also emphasizes maximum security for users. The platform has advanced SSL protection and mandatory two factor authentication(2FA), for example. Users will also get email notifications whenever they login from a different IP address than usual. Plus, CoinDeal is protected by CloudFlare security, with all funds stored in cold wallets. If you want to add a new cryptocurrency onto CoinDeal, then you can launch a vote. Every cryptocurrency added to the platform has to be approved by a certain number of winning votes through the voting system. CoinDeal also offers an affiliate program that will reward users for referring other people to the platform. When you refer someone to CoinDeal, you’ll receive 20% of their trading fees as a reward. During the first three months of operations, CoinDeal will increase this reward to 50%. Native SegWit Address Support: CoinDeal allows depositing of funds on Bech32 addresses. They also plan to contribute to bitcoin’s (BTC’s) upcoming Lightning network because they “are doing everything to make your resources safer and transactions quicker,” explains the official website. Many Cryptocurrencies: At launch, CoinDeal supports BTC, BCH, ETH, LTC, DASH, QTUM, and EUR trading. More cryptocurrencies will be added in the future based on the community’s feedback. 100% Uptime: CoinDeal claims to be fully operational 24 hours a day, 7 days a week. They’re aiming for 100% uptime. Ultimate Transparency: CoinDeal allows users to check the balance of their exchange at any time. You can check the wallet to make sure they have adequate funds to support withdrawals, for example – something that not all cryptocurrency exchanges do. Company Accounts: CoinDeal will embrace corporate users. There will be two different types of CoinDeal accounts available, including personal and business accounts. 24/7 Support: CoinDeal has a support team standing by 24 hours a day, 7 days a week to answer any questions you might have. The maker and taker fee are the same across all cryptocurrency pairs, including BTC/EUR and all cryptocurrency pairs. You’ll always pay the 0.3% maker and 0.4% taker fee. The fees page does not mention any discounts for larger trading volumes. You can verify your profile at any time by going to your profile and following the verification steps. CoinDeal was created by Adam Bicz, Kajetan Mackowiak, and Filip Dzierzak, three Polish entrepreneurs with various qualifications. Adam is an experienced programmer who has worked in Dubai, Kajetan is a marketing and business expert, and Filip is in charge of finances and IT. Prior to launching CoinDeal, the trio created platforms like BuyCoinNow.com and BitcoinAPI.co. BuyCoinNow.com is a bitcoin purchasing service, while BitcoinAPI.co is a payment gateway for cryptocurrencies. Adam and Kajetan also previously created Verified Trading Solutions Ltd., a software company specializing in blockchain and cryptocurrencies. Behind every great project there are even greater minds. CoinDeal is created by three Poles who, seeing the situation on the market, wanted to provide users with the best tool to trade cryptocurrencies. Adam Bicz, Filip Dzierżak and Kajetan Maćkowiak for a long time were working in the cryptocurrency and blockchain industry. Bicz and Maćkowiak created cryptocurrency exchange BuyCoinNow.com, where you can easily buy Bitcoin with the lowest fee and PayCoiner.com, a payment gateway to provide payments in cryptocurrencies. “The experience we have gained by creating other projects, helped us in launching cryptocurrency exchange platform which meets the needs of its users” said Kajetan Maćkowiak. Except for voting system, where every user has the influence on cryptocurrencies implemented on the platform, there is an Affiliate Program. Everyone who invites his/her friend to join CoinDeal will get up to 20 percent of their trading fee. Initially, during first three months of CoinDeal’s running, the reward was increased to 50 percent! Now, after listening to the requests of its users, CoinDeal is more than proudto announce that 50 percent is staying for longer! Check theCoinDeal’s website and its social media accounts: Facebook, Twitter, LinkedIn, VK, and YouTube channel.